The rules explaining how to play these games have not survived, they can only be guessed. Ancient Egyptian children had a variety of toys and games to play with. Some of the above adult board games were played by children. Toys reflected people, objects and events which were common in everyday life. Girls played with toys reflecting the woman's role in Ancient Egypt and boys played with toys reflecting a man's role. Baby toys included distracting toys such as rattles. 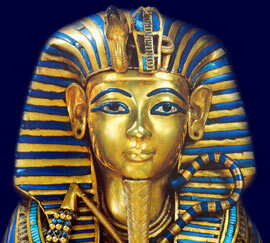 The most popular games and toys played by the Ancient Egyptians are detailed below. Ancient Egyptians girls were known to play games which involved dancing as this type of activity has been depicted on drawings. Ball games, which were made of papyrus, involving standing, running and jumping were also popular. Dolls were favorite toys for girls and made of wood, clay, papyrus or linen. Children have always been fascinated by animals and a variety of these animal toys were made as mechanical devices or with draw strings and had moving parts. The girls also enjoyed dressing in adult clothes and applying make-up. The boys also played ball games and with animal toys. They also enjoyed more boisterous games and piggy back and leapfrog. Toy swords and spears were used emulating male adults. Marbles, darts and bowls were also used in favorite games for boys. The Nile played such a great part in everyday life that activities surrounding the river were also popular especially toy boats.